Lori Calabrese Writes! : Ever wonder about the Easter Bunny's Assistant? Ever wonder about the Easter Bunny's Assistant? 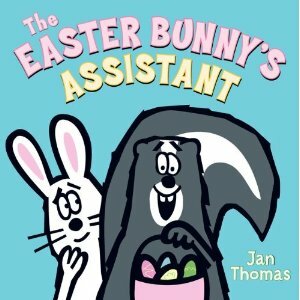 All of you Jan Thomas fans out there will be excited to grab her latest, THE EASTER BUNNY'S ASSISTANT. In Rhyming Dust Bunnies fashion, Thomas has comprised another funny interactive read-aloud that will have young readers roaring. Young readers will really get a kick out of this one and find it hilarious. The illustrations really add to the story and they'll enjoy the instructions at the end for making beautiful eggs. And hopefully when you color your own, we can only hope you won't have a skunk in the room! I really enjoyed reading that book!!!!! Have you built your leprechaun trap?